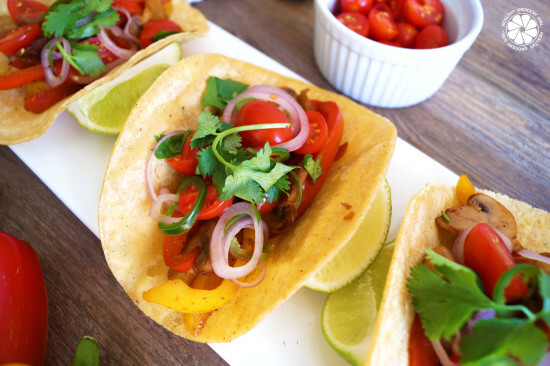 What I like about Fajitas is that they are so easy to make and are so versatile! 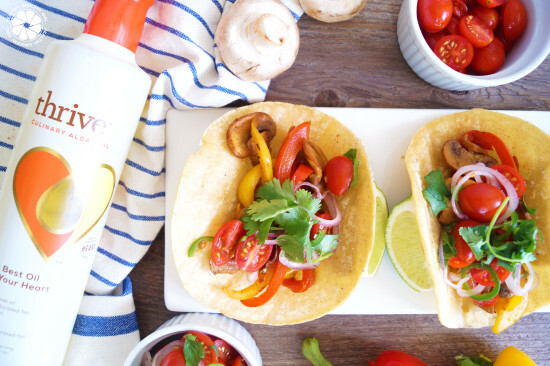 Today I’m sharing how to make spicy mushroom fajitas using a new cooking oil I’ve recently discovered and I am loving! I’ve partnered with Thrive Culinary Algae Oil for today’s recipe. Your reaction may be the same as mine was when I first heard about Algae Oil. Algae? Does it taste like seaweed or the ocean? Actually, not at all! Algae oil has a light delicate flavor that really lets the natural flavors of food shine through when you’re cooking with it. 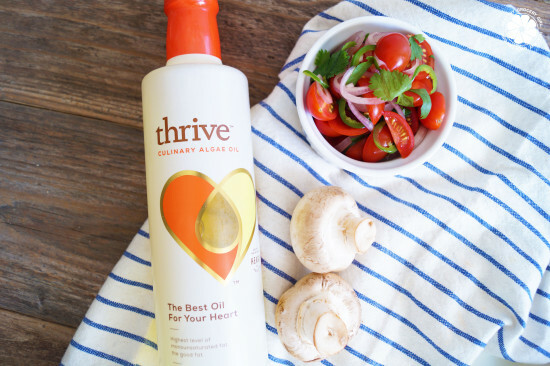 Thrive Alage Oil is the first-ever culinary algae oil on the market and is great for everyday cooking whether you’re sautéing, baking, frying or making an herb-infused salad dressing. Nutritionally, compared to other oils algae oil has the highest level of monounsaturated fat and the lowest level of saturated fat. We need a good balance of mono and polyunsaturated fats to help maintain overall health. Okay, let’s get to the recipe! 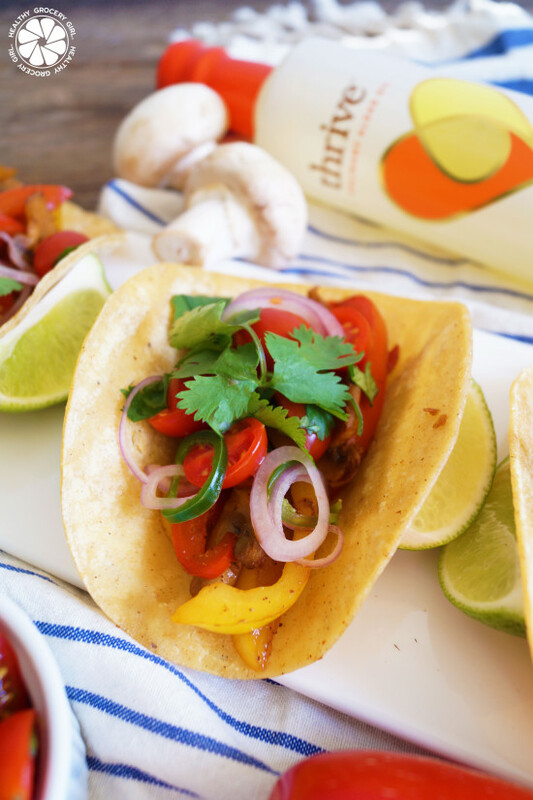 A quick healthy dinner or lunch! Wash, core and thinly slice the bell peppers. Rinse, pat dry and slice button mushrooms. 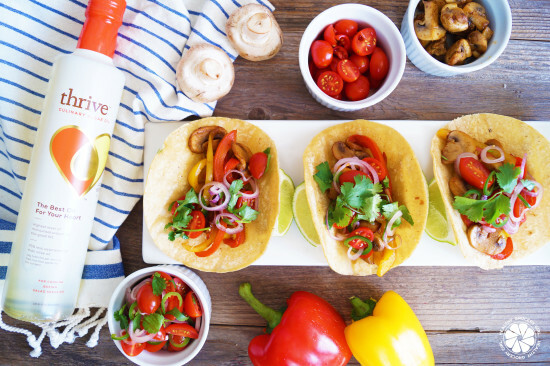 Add one tablespoon of Thrive culinary oil to a sauté pan over medium heat, when the oil is hot but not yet smoking add your bell peppers and cook with a lid on for 3-4 minutes. Once the bell peppers are starting to soften add the mushrooms, cumin, Aleppo, salt and two more tablespoons of Thrive oil. Stir together and cook with the lid off for 5-8 minutes until your desired tenderness. When sautéing vegetables, I prefer them to get a little char and be mostly soft, but with the slightest bit of crunch left. 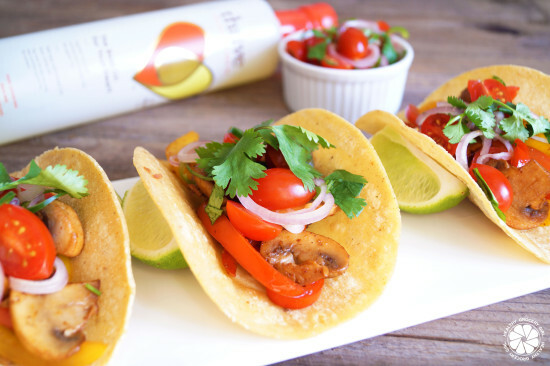 While the mushrooms and peppers cook, lightly coat the corn tortillas with the remaining Thrive culinary oil. Heat a separate sauté pan over medium, and place each tortilla in the pan for 1-2 min. You want only a light crisp, set tortillas to the side covered with a clean cloth to stay warm. 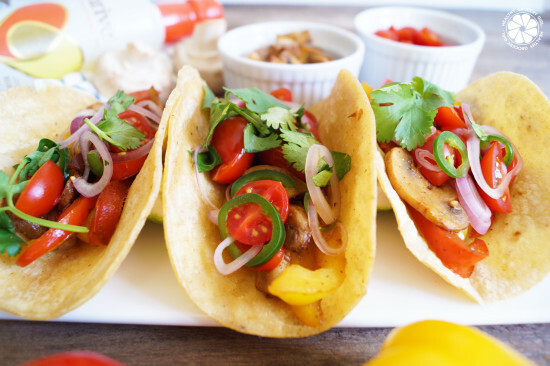 Once everything is finished, top tortillas with sauté mix and some salsa. Enjoy! Also great with slices of fresh avocado! Disclosure: Thank You To Thrive Culinary Algae Oil for sponsoring this post. All opinions are my own. I only share, promote & recommend what I truly love, use and want you to know about.